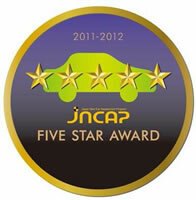 Tokyo, April 25, 2012 – Fuji Heavy Industries Ltd. (FHI), the manufacturer of Subaru automobiles, today announced that the Subaru LEGACY (Japanese specifications) received "JNCAP FIVE STAR AWARD" in New Japan New Car Assessment Program (JNCAP) 2011. Conducted by the Ministry of Land, Infrastructure, Transport and Tourism and NASVA*, JNCAP assesses and compares the safety performance of commercially available vehicles in Japan. 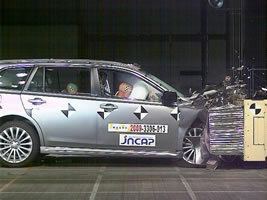 This "JNCAP FIVE STAR AWARD" that Subaru won this time is the prize which is given in the finest 5-star rating car for the new overall safety performance rating including the newly adopted test evaluating "pedestrian legs protection" in collisions. In 2010 the LEGACY received the JNCAP Grand Prix ‘09/'10 as the most excellent safety car and the IMPREZA also won JNCAP Grand Prix ‘07/'08 in 2008. FORESTER and EXIGA were awarded with the title "Excellent Car" in 2009. Those remarkable achievements prove Subaru's consistent efforts in developing safe cars. FHI aims to offer "Enjoyment and Peace of Mind" through the Subaru experience, its brand statement "Confidence in Motion" at the foundation. Subaru will continue to pursue all-around safety and provide the peace of mind to its customer. NASVA holds new car assessments on selected cars every fiscal year and tests various factors of their performance in collision safety such as "full-wrap frontal collision" and "pedestrian head protection". Its aim is to encourage the use of safe automobiles by increasing the users' awareness in automobile safety and to promote the development of safer cars by manufacturers.